On Wednesday morning our shift started at 6 am in OSH tower again. We left the hotel about 5:35, and got to the airport grounds about 10 ’til and headed to the “B” lot, which is fairly close to the tower. All the tower people and the vendors park in the “B” lot – which plain old visitors would KILL to park in because it is free (other close parking is $8) and close. That gate was still locked because the EAA hadn’t gotten there to unlock it yet, so we had to backtrack and drive right to the base of the tower and park inside the tower fenced area. That area is normally reserved for other FAA people, but an opening shift is fairly important, so our team lead made the call to park close. I wasn’t nearly as nervous climbing the stairs for the second time. The weather plays a huge part in how busy the tower gets, how many departures want out, and how many arrivals want in. There was a light rain on the drive in which quit by the time we got in position. The “openers” take all 4 frequencies to start the day. We stood at the North Local position which faces rwy 9/27. We keyed up the frequencies for South Local, Itinerant Mobile (which handles rwy 9/27 departures) and Fly-By Mobile (which handles rwy 18/36 departures). The South Local position is split off around 6:45 only because the airport opens to departures at 6 am; arrivals have to wait until 7 to come in. A low ceiling drifted over us around 7 and stayed until almost 10. This slowed down the arrivals up the Fisk arrival (from yesterday’s work assignment). There was still a taxiway closed from the accident of Tuesday night, which made the taxi procedures from the south side of the airport to the north way more complex. EAA, FAA, and Airport Personnel all had to try to figure out a plan for airplanes to move around this cinch point. The crash clean up crew was still trying to mostly clean up the area of the accident by hauling away the fuel-soaked dirt and replacing it with clean dirt. The normal north/south taxiway along with a small pave ditch that ran parallel were both still closed, and they were the easy way to get back and forth along the airport. The FAA doesn’t normally control any ground movement; they leave that all up to the EAA flagmen. We spent most of our three rounds of work on the North Local position. IFR arrivals this morning came straight west across Winnebago Lake on the VOR 27 approach. If you remember, the Fisk arrivals enter from the southwest and into the right downwind of rwy 27. So the communicator has to sequence the VFR arrivals (who are the “rock your wings” crowd, and don’t normally call on the frequency) with the straight-in arrivals. There were more than the normal number of IFR arrivals this morning because of the low ceiling. It was VFR weather at the field but the ceiling stayed around 1200 feet. I felt like my turn on the ‘communicator’ position went well and I could mostly keep up with the flow. The supervisor and the team lead kept telling me I was doing fine and to RELAX, though, so I must have been at “defcon 1” with my radio voice. So we’ve all learned that nothing beats a straight-in, right? Not here. The ONLY straight-in IFR arrival we didn’t turn airplanes in front of was a C750 that stayed pretty quick all the way to the threshold. It was funny because the veterans just kept telling me to “turn their base” and land “on the green dot”. And it kept working great. All the while, the MOOCOW (which is some acronym that means the departure/takeoff controllers) kept clearing airplanes for takeoff. They stand right down by the runway, with a frequency of their own, and wave the planes on to the runway and clear them for takeoff. It all happens really quickly and is amazingly safe. We have an FM radio (that looks like a walkie-talkie) to tell the MOOCOW controllers about straight-in airplanes because those arrivals are difficult to see over the lake. The MOOCOW controllers normally watch the base turn for airplanes to gauge how many departures they can get out prior to an arrival. In the midst of this, the high performance arrivals that are VFR come in from the south. They report over Fond Du Lac, then they report over Warbird Island, which is about 4 miles south along the western shore of Lake Winnebago. We then ask them to report a 2 mile left base to runway 27. They get sequenced. Demo aircraft (who are there trying to sell airplanes, thus the “demo” moniker) report over the prison, which is about 5 miles north. They get a right midfield downwind entry and to report downwind. The right downwind spotter has to find them, mix them with the Fisk arrival downwinds, and tell the communicator what to say to get them all in a line. Then that line gets mixed together by the left base spotter all into a final. The hardest part of this communicator position for me is to repeat what the spotters say without looking to try and find the airplanes I am talking to. They kept telling me to watch the final and the runway and remember to tell the landers to exit quickly, follow the flagmen, and “welcome to Oshkosh”. It just wasn’t my job to see the airplanes I was talking to actually do the things I was telling them. The spotters watch them to see if they are following instructions; not me. It’s kind of like a real life trust walk. I gotta believe that the spotters have told me everything to say that needs saying to get all the planes landed. This day was over too soon. I just want to keep working, take a short break, and go up and try again. It’s a way better rush than a video game, a scenario in the TTG lab, or even Air Traffic Madness 2 (on the computer; is that the right name of the game?). It’s real life, it’s real pilots, and we are all absolutely thrilled to be part of the day. Tuesday afternoon our assignment was to work at the Fisk VFR approach control. There is a little town in Wisconsin called Fisk, and on a hill in that town is a small camper. Attached to that camper is a astroturf-covered patio/deck roughly the size of the awning that shades the southwestern side of that same camper. On the deck is a folding table next to a truckbed toolbox. That toolbox holds a bunch of electronic equipment used for the transmitting and receiving of control instructions from the controllers. We controllers are stationed at the table there, with one person doing the communicating. The radio we used is just a simple hand-held microphone with no headset capability and only speakers to hear the pilots call. The other 3-5 controllers are using binoculars to find the airplanes and relay instructions to the communicator. In that 50 page NOTAM for the Oshkosh airshow, several of the pages are devoted to the “Fisk Arrival Procedure”. Basically, most of the pilots that want to fly to Oshkosh are directed to find a point yet further southwest of OSH called Ripon (pronounced “rippin'”, not “rihpawn”). Once those pilots have navigated to Ripon, the follow railroad tracks northeast-bound. Our job at Fisk is to spot these airplanes, ask them for an identifying “wing-rock”, and then put them in a line to whatever runways are in use at OSH. We use primarily type of wing, then color to transmit to them and confirm their identity. For instance, (an easy one) “V-tail bonanza 1 mile southwest of Fisk, rock your wings”. He does it, and we say, “Good rock, V-tail bonanza, follow the tracks northeast and enter a right downwind rwy 27, monitor tower 118.5”. Yesterday, the runways in use were rwy 27 and rwy 18R and rwy 18L. So our instructions to the pilots were either the right downwind rwy 27 or “turn eastbound along Fisk Avenue and enter left crosswind rwy 18R”. As we got there and started working, a Saratoga landed on rwy 18R and his gear collapsed. After that, we could only sequence the arrivals to the right downwind to rwy 27, because the airport had to get that airplane off of rwy 18R. Fortunately, there was not a huge rush of traffic so it wasn’t that difficult to get the arrivals spaced and following properly. At 3-5 minute intervals, we made a blanket broadcast to all the arrivals on the Fisk arrival that was something like this: “approaching Ripon, pick out an aircraft of similar speed and follow 1/2 mile in trail. If possible, maintain 1,800 feet and 90 knots. If unable, maintain 2,300 and 135 knots, no faster.” With this broadcast, the pilots had the broad brush strokes of what needed to happen for the airport landing sequence to at least be set up. We worked until almost 3 o’clock, and then the airshow “airboss” took over the airspace so the airshow could start. At that time, we called OSH tower and asked them to take the frequency. No aircraft (that aren’t part of the airshow) could arrive or depart OSH while the airshow was in progress. 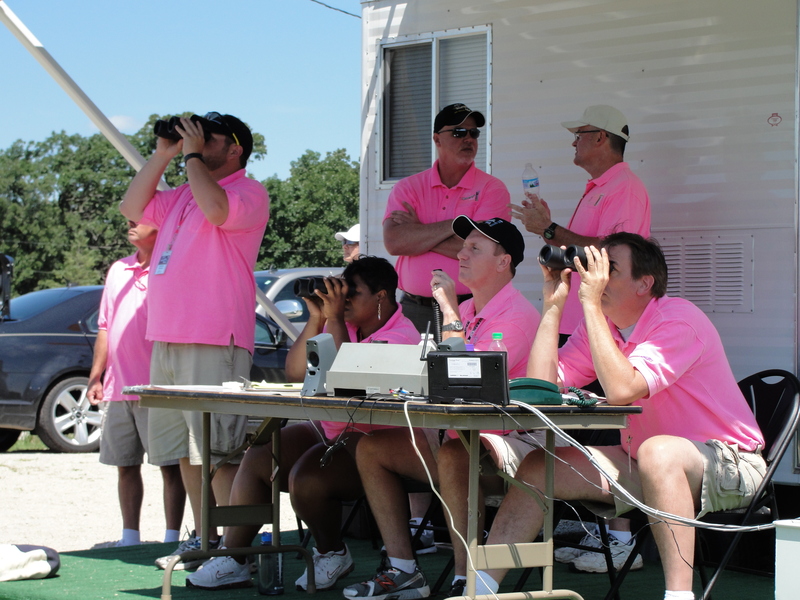 We were able to monitor the airshow frequency and occasionally see the airplanes in the show off in the distance. At around 6:10 the airshow was finished and the airboss released the airspace and airport back to OSH tower controllers, and we took the Fisk arrival frequency back. Arriving aircraft monitor the OSH arrival ATIS, so they know when the airshow is over, the airport is back open, and they can come in to land. Sure enough, about 6:15 we started to see airplanes coming up the railroad tracks on the arrival procedure. We continued to line them up and send them to either rwy 27 or rwy 18R until OSH tower called us and told us to hold all arrivals. “Stop all arrivals, we’ve just had an accident on the runway”. That’s all we knew for several minutes. We made another blanket broadcast to tell all the arrivals that the airport had closed due to an accident and the delay would be at least an hour. As aircraft approached Fisk, we usually had enough time to two-way communicate with them, repeat the delay, and ask them to hold over Rush Lake, Green Lake, and points further out from Ripon. There is a published holding pattern over both those lakes, but I was surprised by how long it took each airplane to fly one hold over each spot. That’s the point, though. To take up time and provide a place where all the planes can circle, see each other, and sort of stay in line – waiting for the reopening. Around 7:15 the OSH airport made the determination to not reopen the airport before the normal 8 pm closing time. We made that blanket broadcast and offered several close alternate airports for those aircraft on frequency. Most of them headed for either Appleton airport or Fond Du Lac airport. We continued to monitor the Fisk frequency and confirmed with several aircraft that OSH was closed and they’d have to seek another airport for the night. 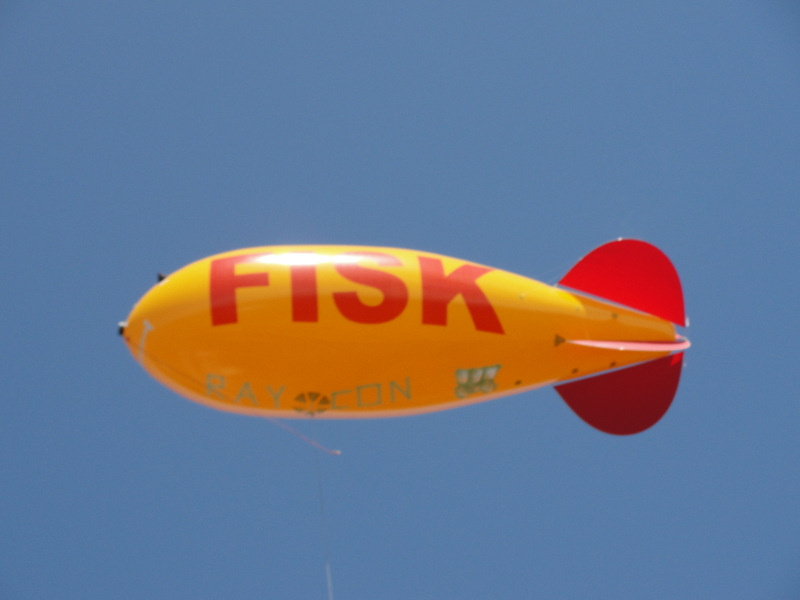 We reeled in the Fisk blimp and stored it in the nearby storage container – which was like a shipboard container. After putting all the equipment in the trailer, we took one last look down the tracks and headed for the hotel. This simple little platform attached to a trailer out on a hill in the country is the perfect first point of contact for the greatest airshow in the world. You know all those air shows where you go and walk around and say, “wow, that’s a really cool Ercoupe”? or DC-3, or Stinson, or Stearman, or Long-Eze, or J3 Cub, or Cessna 195? Or whatever your favorite airplane from history is? The difference between this airshow and other regional airshows is that Oshkosh has entire ROWS of your favorite airplane. Rows and rows of planes, all tied down, most with simple tents pitched under the wing and a Coleman stove and cooler placed under the engine cowling. As I’ve mentioned, the grounds were flooded with rain late last week, so the full-blown fly-in and camping/parking is really just ramping up this afternoon and will be close to business as usual tomorrow morning. So there are lots of spaces still unoccupied by planes. The veteran pilots and controllers who’ve been here many years say they’ve never seen it this empty. And still, there are solid rows of your favorite airplane. Aeroshell Center is one of the central points of the show, where they park a lot of the feature airplanes. A Falcon Jet came in the other day with new winglets, we called it “Winglet One” when we cleared it to land. The winglet is actually a double winglet that is closed at the top. It looks like an oval – an “O” – attached to the end of each wing. All kinds of business jets, domestic and foreign, flew in, parked on the feature pad for a while, then taxied to their corporate spots. AirTran flew a B737-700 in, disgorged a whole plane load of people, then took off again. We walked up and down the flight line for about 6 hours today. You may have seen the pictures of the DC-3’s flying formation over Oshkosh, then coming in to land. If you haven’t, then check out http://www.airventure.org. They have an amazing photo album! By the way, they publish a newspaper every day about what is happening at the airshow. The pictures in this morning’s paper were from yesterday afternoon. Quick turnaround! They started the airshow with parachute jumpers – one had a huge American flag trailing from his leg. As he descended, a woman sang the National Anthem. A flight of T-6’s, (the WWII kind, not the Raytheon kind), did several fly-bys, followed by a flight of T34’s (the WWII kind, not the new trainer kind). They had two Ford Mustangs race two quick aerobatic planes down the runway! Stunt planes did gravity-defying moves for an hour or two. There are just no words to describe watching them stay in the air when it looks impossible. We saw less than half what is there today, and I’m wiped out. It’s a good wiped out, though. I will say that so many people came up to us to mostly say “thank you, you guys do a great job!”. Or variations on that theme. I feel a little like a pretender because I’ve done very little of the work this year, but I am part of a team that does amazing work. Year after year, this group of controllers moves what still seems like an impossible amount of airplanes safely in and out of this airshow. If you want to hear some of the air traffic control at the show, check out http://www.liveatc.net. And still the veteran controllers let me stand shoulder to shoulder to them and share the thanks of all these pilots. I played it cool walking up the tower steps of Oshkosh tower, but I’m tellin’ ya, I was headed into the center of the universe for these two weeks in July. Let me remind you that I am one of 9 rookies who’ve never seen the inside of this tower before. I was the only one there first thing this morning, so I had no choice but to head up there, strap my headset on, plug in where my team lead told me, and try not to sweat. It didn’t matter that there weren’t any airplanes there this morning at 6 am; I was plugged in to talk on the frequency at Oshkosh! My first transmission in Oshkosh tower was to a DC3 coming in on the “Warbird arrival”. He called over FLD (remember from yesterday?) and I told him to “report Warbird Island”. Warbird Island is southeast of the rwy 36L approach end about 5 miles. Once he reported over the island, I said, “DC3, rwy 36L, cleared to land.” It was funny because the DFW guy is the team lead and he has to/gets to listen to me all week and make sure I am saying what they’ve told me to say. So he looks at me after the Warbird Island call and says, “well, clear him to land.” It was awesome. I was the 3rd person of my team to be the ‘communicator’. Which was good because I could see how the whole system functions. The communicator is talking, then there is a spotter for the right base and close in left base, then there is a left base spotter. This is all for rwy 36L and 36R. The two spotters tell the communicator about the next airplane exactly like the communicator would say it. For instance, I see a bonanza on the left base so I say to the communicator, “V-tail bonanza on left base rock your wings”. The communicator repeats over the radio what I have just said about three words behind me. He will probably not see the bonanza until he turns final. I am looking at the V-tail bonanza with binoculars the whole time. If he rocks his wings, I say to the communicator, “Good rock”. The communicator then says, about three words behind me, “Good rock, V-tail bonanza, rwy 36L cleared to land, keep it in the air until the yellow dot”. The yellow dot is almost halfway down the runway and reduces taxi time if the pilot can stay airborne until partway down. The close in spotter then takes over the “transmissions” to the communicator to tell the pilots to put their gear down and/or start their descent and/or who to follow on base or final. I only keep looking at the far left base to tell the communicator which airplanes are up next. The close-in spotter then finds THAT guy, and tells the communicator who follows whom. The EAA has painted different colored dots on the runway so pilots have a spot to aim for. Many times there will be at least 3 aircraft on base, all headed for a different specific point on the runway. We’ve gotten a waiver to use 1500 feet between little single engines, and 3000 feet between twin prop airplanes. Bigger stuff than that uses standard runway separation. Ok, then we took a break for a whole long time. There are three crews assigned to OSH each morning shift, and each evening shift. Actually, JT’s (John Trowbridge) crew took over for us early this morning. When we went back up to work, we got to work the other runway. Rwy27 is set up much the same. I was in charge of the right downwind, another spotter was in charge of the close downwind and right base, and the team lead was in charge of straight in spotting and watching for departures. Yeah, the departures get their own frequency and their own set of controllers who are staged on a mobile platform right down by the runway. We work that later this week so that will be another whole new experience. Way too soon, our work day was again over as the afternoon crew came up the steps and relieved all four of us as well as the team working the other runway. If I’ve done my math right, it takes 40 controllers to work OSH for one day. Two separated LC’s, two separate departure mobile platforms, and a relief team for both the morning shift (6-2) and the afternoon crew (12-8). There are supervisors and Ops Managers in the back that watch each team, and help with the sequencing and special flight handling. A flight of 7, for instance, gets a mention, but that is no big deal for the team. “First of the flight, rock your wings”. “Good rock, cleared to land. Last of the flight, rock your wings”. Then we know where the flight ends, and the next airplane is separate. It is simply amazing how both Local Control crews function without getting in each other’s way, and how the departure crews get airplanes out in between arrivals. All overseen by the supervisors and the Ops Mgr, these airplane arrivals and departures just weave together to get in and out like they want. Our team has a day off tomorrow. I plan to visit the seaplane base in the morning with my team lead, then spend the rest of the day on Wittman Field, absorbing history in the making. The theme of the airshow this year is a “Salute to Veterans”. There are a ton of DC3’s scheduled to come in; they are calling it the last great gathering of DC3’s. I have never been so excited to get back to work on Tuesday. We work at Fisk VFR approach control, where the airplanes are given a runway assignment and frequency change to the right Local Control. After our workday was done, we got to take a helicopter ride over the whole airport. Get this; THEY thanked US for coming over to take a ride! Last night’s computer problems are solved, although no thanks to me, so I can tell you all about Fond Du Lac. Fond Du Lac airport is about 14 miles south-southwest of Oshkosh airport (Mitchell Field) which is where the main EAA airshow is held. FLD (the abbreviation for Fond Du Lac) is kind of an overflow airport for the show in general. The grounds at OSH (the abbreviation for Oshkosh) have been so soaked and flooded that the normal camping and parking hasn’t been available. Consequently, some of the normal OSH traffic headed over to FLD. We were the first crew to work the FLD tower, so when we got there at 630 a.m., we got to get the radios set up and turned on. We checked the frequencies with Milwaukee Approach Control, who called the IFR inbounds to us over a direct dial/shout line. We checked the radios and the phones to OSH tower, and we checked the emergency airport vehicle radios, too. FLD has its own frequency to use. The pilots, after reading the NOTAM about the EAA fly-in, decide to park at OSH or at FLD. If they choose FLD, they call us on the frequency with their type, call sign, and position relative the FLD airport. We issue pattern entry instructions and a distance away to report in. We DO use call signs at FLD; there’s not the volume of traffic to preclude that. I got to record the first ATIS of the show at FLD! Which is only exciting for a rookie at the show; but, hey, I’ll take the excitement. The ATIS equipment is exactly the same as Wichita – and the ORD and DFW controllers had no idea how to use ATIS stuff anymore. which was funny. Their’s is all automated and they just move big jets all day. We went almost two hours without a customer. It was a beautiful morning, though, and it was fun to stand around and swap stories about air traffic legend stuff. The ground control position is inside the mobile tower. The mobile tower is about 20 feet up in the air on a sturdy metal framework with steps up to it. It has an air conditioner, phones, and those old radios with actual switches to activate transmitters and receivers. The first ATIS never did make it on the air because the transmit switch wasn’t in the right position. Local Control gets to stand outside on the catwalk with pilot-like headsets. The frequency goes through the headsets and the ‘talker’ can intercom with the ‘spotter’ who has a pilot-like headset, too. When I worked LC, my team lead had no override. I was it! Fortunately, it never got too busy and I could keep up with the airplanes and callsigns (recorded on a big whiteboard with dry erase). My first transmission was to a Skycatcher inbound from the northeast. “Skycatcher 986 enter a right base runway 18”. He, of course, coming from the northeast, really needed a LEFT base, which he suggested, and I agreed with. He came with 3 others who gave rides to Young Eagles all day in the touch and go pattern. At our busiest, we had 4 enter on a left downwind to rwy 27, then 4 on the right downwind to rwy 27. It was fun and exhilarating and not even scary (hardly). Our time on the frequency ended around 1 pm when the afternoon crew came to take over. We relieved positions sort of one at a time – but all at the same time, too. I was on ground at the time, and just told the relieving controller about the 4 “ride-givers”, and the two or 3 vehicles that had been driving around. We watched them work for a minute or two, then walked down the metal steps, into the adjacent trailer to get our junk, and drove off to find some lunch. We ate at Culver’s, which is like the local Braum’s. Guess what? They sell cheese curds. Like deep-fried cheese balls. pretty awesome. Day One couldn’t have gone better for me and our crew. It started slowly, but had a lot of promise for the week. For you controllers – it is AMAZING how nice and considerate and helpful all these 67 other controllers are. I am serious when I say I have not heard one negative thing said by any of these controllers about working the Oshkosh air show. You know how negative and crabby we can be; and it just isn’t here. It is truly the best of the FAA that I have ever seen. All I knew of the Oshkosh air show was the mayhem I’d heard on the radio when someone played a clip of the tower, and that the air traffic controllers wore pink shirts. I applied to work the Oshkosh air show, as a rookie, and was finally selected in the second round, only after 2 original selectees had to drop out for one reason or another. I jumped at the chance to travel up here to Wisconsin and join this legendary band of controllers that volunteer to talk airplanes into and out of Oshkosh. The NOTAM itself, describing the procedures pilots need to know to fly in, is 30 pages long. Our training manual is over 100 pages long. The more I read, the more I realized I would only understand when I stood next to the experienced controllers and watched it happen. Tom Poberezny, the chairman and president of Experimental Aircraft Association, spoke to us this morning as we started our one day of training. He has been orchestrating this show since the 1970’s. It now hosts over half a million people and has over 10,000 aircraft operations in the 10 days that the FAA provides controllers. Controllers in general are a rowdy bunch – we don’t like to quit talking to hear other people talk. I have never heard a quieter bunch of controllers as when Tom spoke to us about this year’s show. Mr. Poberezny spoke for 15 minutes about his love of aviation, his pride in the volunteers, the logistics of the show, and the myriad of details he and his crew will conquer and solve. He thanked us (!) for coming to work the show. He appealed to our better nature and asked us, for many the only “voice of Oshkosh” some pilots will hear, to be ambassadors of the EAA, as well as of the FAA. “We can look to and work for the best that could happen, and not focus on the worst that could happen,” he said. They showed us a video about the spirit of Oshkosh, narrated by Harrison Ford (who is a long time EAA member, a huge force behind the Young Eagles – a training program for student pilots, and a regular attendee of Oshkosh). There are no words to describe the sense of awe and history I felt as this video played. To the aviation world, Oshkosh is the center of the universe for this week and a half in July. Superlatives only cheapen the telling. I hesitate to even write about this because it is so compelling a story, and I understand so little of it. I believe the FAA outdid itself here. Nine of us are rookies. Nine new controllers added to the mix of Limited (1 to 3 years of experience) and Veteran (4 years or more) controllers. The day of classroom was a review for the other 75 controllers – I could tell they’d forgotten very little since last year. I was, and still am, humbled by all they have memorized, worked, solved, and seen in the years they’ve been here to work the show. I sat even more quietly as I realized they all needed us 9 rookies to assimilate this information overnight, so we could be contributing members of the team. We each belong to a team of 4 controllers. There is a Team Lead, a Veteran, a Limited, and in about every other team, a Rookie. My team works together the entire week. We each have a schedule of places to work that are set weeks in advance. Controllers staff Fond Du Lac tower, Fisk VFR approach/line up area (about 12 miles from Wittman Field – where Oshkosh is), 2 different Local Controls in the tower, and two departure mobile posts out on airport itself. Tomorrow morning I and my team open the Fond Du Lac tower at 6 a.m. This is an overflow airport that has shuttle service up to Oshkosh. Wittman field is very wet, and the normal areas that they use for parking aren’t available, so there could be a serious amount of traffic using Fond Du Lac. All I know is that I will wear my pink shirt with both pride and humility, and work as hard as I know how to welcome each and every pilot to Oshkosh.